Colorimeters and Photometers are used to analyze samples of water by adding a chemical reagent that reacts with the substance being analyzed and changes its color. 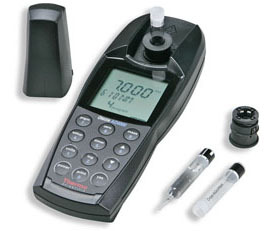 The colorimeter then monitors the light transmission through the water samples to determine the presence and quantity of the substance of interest. The chief advantage of colorimetric analysis is that it provides a simple means of determining minute quantities of substances. The hand-held DR 900 allows quick and easy access to your most-used testing methods. 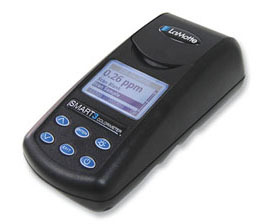 This colorimeter is waterproof, dustproof and field durable. 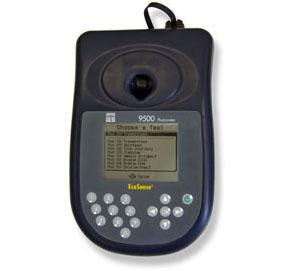 With an intuitive user interface, easy data transfer abilities, and the ability to test up to 90 of the most commonly tested water methods, the DR 900 makes water testing in harsh field environments a little less challenging. 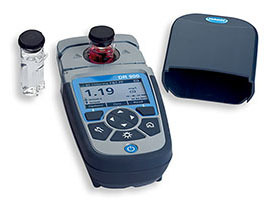 The Orion AQUAfast IV® AQ4000 multi-wavelength colorimeter stores up to 189 pre-programmed methods. A simple upload procedure updates the colorimeter with the most current programs. The upload keeps the AQ4000 always current. The Orion AQ4000 features Auto-ID, which when used with Orion Auto-Test cuvettes, automatically identifies the species to be measured, selects the method, wavelength and reaction timer. The user never needs to push a button! The Auto-ID ensures the reagent is matched to the method. The compact SMART3 Colorimeter® is ideal for water analysis in the field or in the lab. Easy to use software allows the analyst to choose a test factor from over 75 preprogrammed calibrations for LaMotte reagent systems. The reacted sample is always scanned at the optimum wavelength which is automatically selected from the multiple LED optical system and the test result is presented on the large, backlit display. ColorQ DW Photometer kit (Code 2059) is the ultimate portable on-site, hand-held photometer for testing drinking water. YSI's new line of photometers includes the Model 9300 and 9500. Eliminate sample preservation by taking your portable, waterproof instruments to the field to perform the analysis on-site. All reagents are safe and easy to use. Selecting the desired test has never been easier. Simply navigate among the list of available tests on the screen of the instruments to choose your test and say "OK". The instrument will then walk you through the steps to complete the test. Simple. Convenient. Accurate.